Computed Tomography (CT) imaging uses X-rays in conjunction with digital X-ray detectors and computer processors to image the patient. A CT scan is sometimes called a CAT scan (for computed axial tomography). 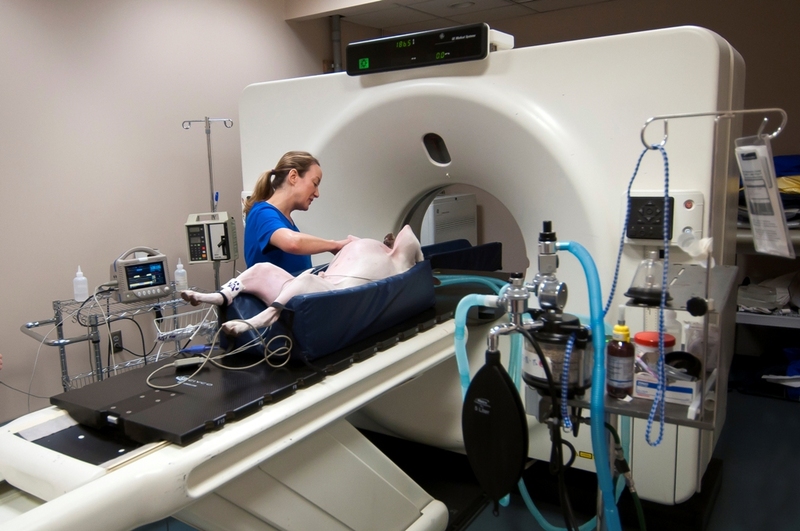 For a CT scan, a dog or cat is placed under anesthesia, positioned on a table that slides the pet through a ring containing the x-ray source and the X-ray detectors. The CT images are cross-sectional slices of the area imaged, as if the patient was cut like a loaf of bread. These slices can be examined one by one to reveal the details inside. Contrast agents containing iodine are typically administered intravenously as part of the scanning process to enhance visualization of abnormal soft tissues and blood vessels. VRIC uses a helical / spiral scanner to rapidly acquire images of dogs, cats and exotic animals. General anesthesia is typically used because most studies require the patient to remain motionless for a few minutes. A CT scan can take a few minutes to an hour depending on the complexity of the exam, the size of the patient, and the number of body regions examined. After the CT scan is acquired and the patient is awake, CT images can be further processed and reconstructed into two-dimensional and three-dimensional images using computer manipulation for further analysis as radiologists evaluate the images. Magnetic Resonance Imaging (MRI) uses a very strong magnetic field to align the natural spinning of water molecules within body tissues. MR images are formed by tiny radiofrequency signals generated as the nuclei spin. The molecular alignment that occurs on the sub-microscopic level cannot be felt and has no known harmful effects. The radio signals are collected by small antennae, called receiving coils placed outside the patient near the area we are interested in evaluating. An advantage of MRI is its ability to produce images that are simple cross-sections as well as from any other angle with equal resolution. MRI scans give the best soft tissue contrast of all the imaging modalities. Our equipment includes a 1.5 Tesla GE Signa Advantage MRI, which is the highest field strength MRI unit available for animals in the state. The center allows pet owners access to advanced cross-sectional imaging for their pets on an outpatient basis in an environment specifically designed to be safe for pets. The MRI center uses specialized, MRI compatible patient monitoring and anesthesia delivery equipment. We use Sevoflurane gas anesthesia for the rapid recovery and to minimize anesthetic complications. We evaluate patient heart rate, blood pressure, oxygen levels, exhaled gas and electrocardiogram activity during the scans so complications are avoided. Similar state of the art patient monitoring equipment is available for patients under anesthesia, if necessary, for CT or radiosurgery. The imaging equipment available at VRIC was purchased from GE and is maintained in top working condition under service contract with Oxford Instruments OiS Technicians, who also provide service in human imaging facilities in the area. A board-certified veterinary radiologist is available at the center to assist in determining the imaging modality of choice and provides the most accurate image interpretation possible. We do our best to minimize the time a patient spends away from their owners with us during a treatment or scanning procedure. In most cases, the pet is back with their owner before all the images have been reviewed and a final radiologist report is generated. Written results of the imaging studies are provided to the referring veterinarian managing the patient's care within 24-48 hours of the imaging study. A digital copy of the imaging study is provided to the owner at the time they pick up their pet. Digital copies of the studies are transmitted to referring veterinarians and off-site hospitals when requested.